"Give your face that fabled glow and charm your way into everyone’s heart! Massage yourself to a wonderful glowing skin and sparkling complexion. Giving you a spectacular face lift, this superb formula gently helps you radiate with a natural brilliance and exude confidence. 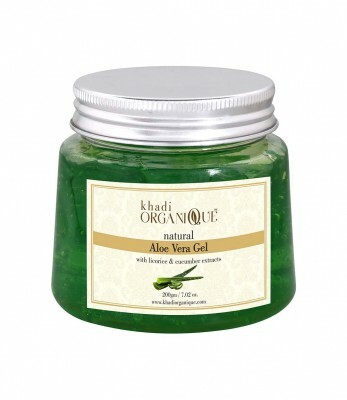 A mystic product from Khadi Organique, it hydrates, nourishes improving the skin tone and contouring. The luxuriant gel is enriched with exquisite nutrients that take away the years from your face leaving you looking young, bright and charming. No more scars and sagging skin with this herbal, restorative, enchanting gel! " " Aqua, Aloe Vera Gel, Vitamin E, Neem Extract, Tulsi Extract, Tea Tree Oil, Lodhra Extract "